Petzl Dual Connect Adjust. Double positioning lanyard with one fixed arm and one adjustable arm. The DUAL CONNECT ADJUST lanyard is a double positioning lanyard with one fixed arm and one adjustable arm. 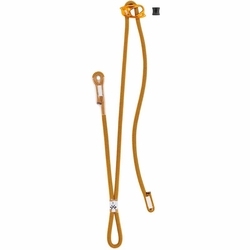 The adjustable arm can be set to the ideal length for rappel maneuvers, on multi-pitch routes, in mountaineering, or when moving along a fixed line in canyoning. The ADJUST rope adjuster's ergonomic shape offers simple, quick adjustment. The ADJUST rope adjuster's ergonomic shape offers quick, precise adjustment.